Have you ever been to the Amazon Rainforest? I’ve never been there in real life, but I have visited through others pictures shared on the web. Most recently, the CEO of Pure Energies, Zbigniew Barwicz, and a small team lead by the International Conservation Fund of Canada, took a trip to the Brazilian Amazon Rainforest. 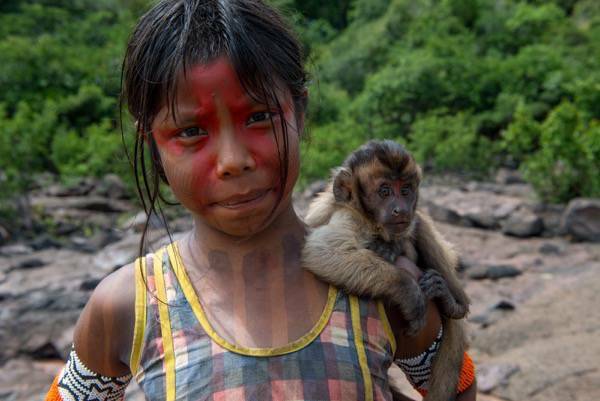 For almost two weeks, they lived alongside the indigenous Kayapo tribe. Not only did they explore the Amazon Rainforest, but they also participated in the Kayapo traditions. One of the most amazing parts of this trip was Pure Energies provided solar light to each household. 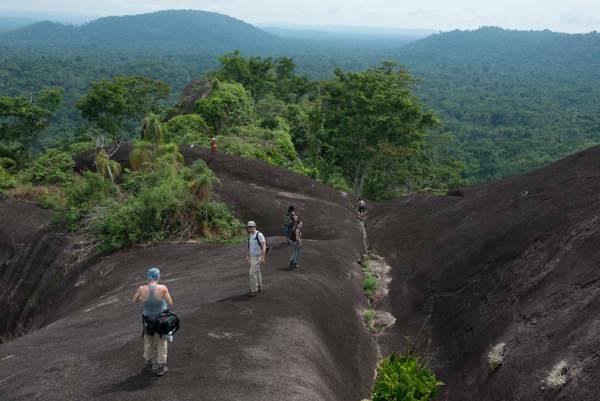 What was the purpose of this trip to the Amazon Rainforest? The purpose was to highlight the Kayapo people and to experience (and then share) what it’s like to be sustainable and independent. Prior to learning about this trip, I had never heard of the Kayapo people. What a fascinating people they are! The Kayapo people protect an area of the rainforest that is bigger than more than half of the countries in the world and equates to the size of Virginia. In fact, loggers, miners and ranchers threaten their land every single day. The land is not only important to the Kayapo people, but to us as well, as it contributes to our planet’s air, water, plants, fish, animals and well-being. As parents of six energetic and healthy children, Shannon and I definitely have our challenges. We can hardly imagine the challenges we might face if we were to raise them in the midst of the Amazon Rainforest! It’s amazing to see how the Kayapo people do it! One of the team members shared her experience with us about how she lived with the Kayapo people for a little over a week. She shared that the Kayapo are the finest blend of courage, strength, wisdom and kindness she has ever encountered. By Western standards, they live rather modest lives. They have contact with the outside world (since the late 1960s) and many opportunities to trade for Western material goods, but by choice, they have no appliances, Internet, vehicles or modern media. Even without those things, their lives are fulfilled and rich! She shared how lucky he was to spend time with the Kayapo people. She took home with him lessons about many things, but what drew him in the most was their family life. The Kayapo don’t have jobs, money or economies, but their purpose is to serve their families and communities. With this focus in mind, there is an incredible energy filled with love, respect and peace that is spread across their villages and their society. From his trip, he took away with him three lessons that really stood out to him. He learned about nurturing strong, independent, incredibly loving children from the amazing Kayapo mothers, fathers and elders she met. Here are the 3 tips to raising kids in the jungle he shared. 1 – Don’t teach your children to be afraid. Spending time with the Kayapo children was magical. They were full of joy – ALL the time! Not because they had the latest iPad or video game (they had none of these), but because they spent time exploring their surroundings, climbing trees, playing with their friends and swimming. The Kayapo parents didn’t teach their kids to fear, but they teach them at a very young age to be independent, to be strong, to help one another, and to protect and care for those around them. She witnessed 7-year-olds carving toy wooden airplanes with machetes half as long as their arms. He viewed 10-year-old girls climbing 30-foot trees to cut acai berries, barefoot, with machetes held firmly between their shoulders and cheeks. Kids in the village are taught to be free and not fear. After all, fear holds us back from reaching our dreams. Kids need and deserve to experience the world through their own eyes. They need to play in the water, climb trees, explore their limits, push their boundaries and learn for themselves what does and doesn’t work, as well as what they should be afraid of. 2 – Expressing emotions makes you strong, not weak. She was surprised by how open, kind and emotional the Kayapo were to both the young and the old. Fathers, mothers and grandparents were not afraid to hug, kiss or play with their children. Families were loving, open and kind to each other. The Kayapo believe that expressing our emotions make us human, not weak. They teach their kids that protection comes from loving and giving to others – freely, openly and without fear. 3 – Who’s better than anyone else? 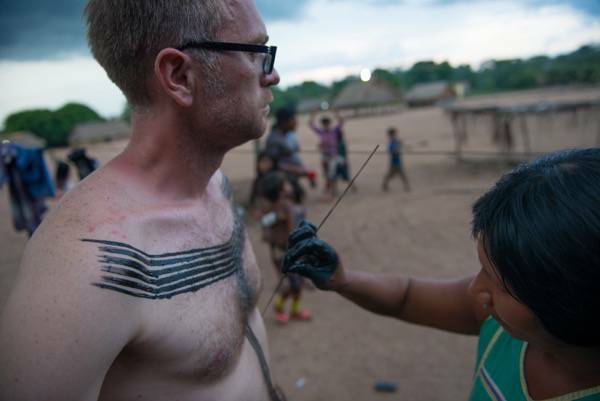 In a Kayapo community, there is almost no sense of “I.” That’s right, no individualism. Rather everyone works as a collective. Kids aren’t taught to undermine other kids or to compete against them in a destructive way. They don’t base their self-worth and self-awareness through manipulation, putting down or rising above others. Instead, everyone is a team – with the same goal – and everyone is respectful. As I mentioned earlier, the Pure Energies team spent a few weeks in the Amazon Rainforest with the Kayapo people. They not only spent time with them, but also provided solar light to each household. For Pure Energies, independence means providing homeowners the decision to take control of their energy bill, and to make their own choices. We are entering a new era – one in which homeowners have the potential to generate and directly use their own power. Energy choice is our future and that of our children’s future, and just like the Kayapo we should teach our children to work collectively and make sustainable, independent, and environmentally conscience energy choices. What do you think? I encourage you to follow their journey to watch never-before seen footage of the Amazon rainforest and this incredible tribe here. Which tip stood out the most to you? Expressing emotions makes you strong, not weak.